In its 120 years of existence, the automobile has become increasingly comfortable and efficient and is currently also facing major challenges, such as alternative forms of propulsion and environmental compatibility. Great expectations are set on the E10 biofuel with a share of 10% ethanol, and electric propulsion. But the use of materials from renewable resources can also help the automotive industry to achieve more sustainability. Despite the variety of biobased materials already available on the market their application in the automobile industry currently exists only in a very rudimentary form. It should however be considered that it is primarily Japanese automakers who apply developments in the field of biobased plastics in real components of current vehicles on the market. In this sense, the Toyota group, which uses bioplastics in cars since 2000, is planning to introduce a new model for 2011 with an interior consisting 80% of new bioplastic materials. The use of biobased plastics is therefore likely to increase in future, tending to replace their petroleum-based counterparts and allowing us to design more sustainable vehicles, thereby contributing to climate protection and sustainability. An important role is currently already played by partially or completely biobased plastics such as polyurethanes based on vegetable oil, polylactic acid (PLA), Bio-Polyesters (such as bio-PET) and natural fibre composites with and without a biobased matrix. Ford has implemented the use of polyurethane (PUR) with soy oil-based polyols in the seat backs and seat cushions since 2008. Johnson Controls is a supplier of seats made of PUR based on "natural-oil polyols" (NOP). Mitsui Chemicals and BASF (PU Solution Elastogran) offer castor oil-based polyols, Dow and Cargill offer soy oil-based polyols for polyurethane foam systems. Mazda also develops bioplastics on the basis of PLA for the interiors of its vehicles under the name "Mazda Biotech Materials". Dupont has developed an airbag plate from the partially biobased Hytrel RS. 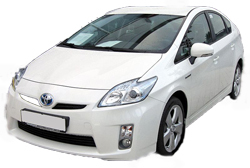 The Toyota Group is using for the fist time in bio-PET from renewable raw materials in vehicle construction. The material is partly based on sugar cane and installed in the Lexus CT 200h. "The innovative material jointly developed with Toyota Tsusho Corporation developed distinguishes itself from conventional bioplastics by greater heat resistance, longer life and better shrink resistance. According to Toyota, It can also be used for seats, carpets and other interior components with high requirements that cannot be met by previously known organic polymers". Moreover, Toyota asseverates that the CO2 balance of bioplastics is also" considerably better than that of conventional materials based on petroleum" because it "contributes to a reduction in CO2 emissions throughout the whole product cycle and protects limited petroleum reserves." Furthermore, Toyota has used bioplastics for a series of injection-moulded, foam and board components (boot linings, door trim panels, seat cushions, rear parcel shelf) in the Lexus HS 250h. About 30 percent of the interior and boot coatings are covered with bioplastics. The car-tyre manufacturer Goodyear has developed a tyre (BioTRED series) in which the rubber mixture contains corn starch. This tread mixture is to be used for the Goodyear GT3. "Usually, the filling substances are made from carbon black and silica. The advantage of corn starch is shown both by the reduction of CO2 emissions, as well as in production, because less energy is required for production", according to Goodyear. Furthermore, Goodyear says that the tyre rolling resistance is lower and therefore also the volume of CO2 emissions. However, it is expected that many products made from bio-based plastics will no longer be unique in the near future, but will be manufactured in large batches, even if they are currently not available in sufficient quantities or at competitive prices. Bioplastics have the potential to achieve the cost levels of petroleum-based materials at higher production volumes.